New York Times bestselling author Cora Carmack's young adult debut: Roar. In a land ruled and shaped by violent magical storms, power lies with those who control them. Aurora Pavan comes from one of the oldest Stormling families in existence. Long ago, the ungifted pledged fealty and service to her family in exchange for safe haven, and a kingdom was carved out from the wildlands and sustained by magic capable of repelling the world’s deadliest foes. As the sole heir of Pavan, Aurora's been groomed to be the perfect queen. She’s intelligent and brave and honorable. But she’s yet to show any trace of the magic she’ll need to protect her people. To keep her secret and save her crown, Aurora’s mother arranges for her to marry a dark and brooding Stormling prince from another kingdom. At first, the prince seems like the perfect solution to all her problems. He’ll guarantee her spot as the next queen and be the champion her people need to remain safe. But the more secrets Aurora uncovers about him, the more a future with him frightens her. When she dons a disguise and sneaks out of the palace one night to spy on him, she stumbles upon a black market dealing in the very thing she lacks—storm magic. And the people selling it? They’re not Stormlings. They’re storm hunters. Legend says that her ancestors first gained their magic by facing a storm and stealing part of its essence. And when a handsome young storm hunter reveals he was born without magic, but possesses it now, Aurora realizes there’s a third option for her future besides ruin or marriage. She might not have magic now, but she can steal it if she’s brave enough. Challenge a tempest. Survive it. And you become its master. Rich Adventure You Don't Want to Miss Out On! Roar is an adventurous, richly imaginative tale bursting with magic, friendship, and loyalty. 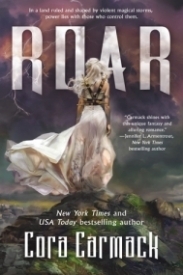 Roar is an action packed adventure full of fantasy, magic, and romance. In it we follow princess Aurora as she tries to make herself into someone she is not. Her lack of powers not only scares her, but she allows it to define her until her betrothed pushes her over the edge and she finally takes her future into her own hands by joining storm hunters. She runs away from her home and her arranged marriage to journey with storm hunters and change into a girl named Roar. Her adventure is filled with newfound knowledge and loyalty as she struggles to balance the life she had with the life she now leads. She missed out on so much, nothing will ever be the same again. What made this book so enjoyable for me was the storms. They are magic but they are alive and the hearts hunters take for power are essentially the hearts of people. Each storm acts in a different way, a way that connects to an emotion. The author brilliantly combines the two so that we question how we didn't figure it out ourselves. The rich world and descriptions never fail to captivate your attention! The world has a lot of potential and I would love to read more about it in the next book! It was brilliant, especially in terms of the storms and how each has a soul. I adored every minute that allowed me to learn more! As for characters, Roar is a strong, brave girl who has a lot of potential. In the beginning she let her fear lead her and that not only made her miserable, but it allowed others to take advantage of her. The amount of growth that occurred in the duration of her adventure with the storm hunters is enjoyable to read about. And like all good characters, she has her flaws. She could be mildly annoying as well as selfish at times. I found her overall to be brave, reckless, and also selfish. All she could think about was how she can't marry that horrible man and she must gain power for then she won't need to even if she returns. She leaves her mother at the mercy of those horrible men, and a good friend to the dungeons. While traveling with the hunters she causes many distractions and somehow she finds love. She is a great character full of wit and stubborn strength, but she never thought things through and didn't care for consequences. Locke was very kind and compassionate at first, before he knew she wanted to join up with them and throw herself into danger. He constantly gave her chances to leave and when that didn't work he tried his best to show her that she was not making a good choice. However he doesn't know her true identity or her actual intentions, so he never really understands her motivation and dedication. He tries his best to protect her and along the way, his reason for doing so changes. The romance with Cassius made my heart beat a little faster. Such a dark, brutal man, and yet he was gentle and caring with her before he even really knew her. We see constantly throughout the book how much he has come to care for her, however that doesn't seem to change his plans. Locke on the other hand was jealous, rude, and possessive when he wasn't ignoring her or passionately making out because he actually really does care and that scares him. The romance has the potential to grow in the next book. Overall, Roar is an adventurous tale full of mystery and magic. It is definitely worth a try! DNF PAGE 133 - I hate DNFing a book. I hardly ever do it. I personally feel like I'm giving up when I DNF. I know other people do it all the time and there is nothing wrong with that. We are all different and that's something awesome. I'm not picking on anyone who DNFs a book. Please don't think that. That being said, I wanted to love this book. It has a lot of great reviews. At the time of this writing it has a 4.03 rating on Goodreads. I know there are some that says it's fully of misogyny but to me, I saw none of that. Again, we are all different and see things through different eyes and different life experiences. So no bashing. I just didn't personally see any of that. The premise is so cool, so different. A land ruled by storms and those that can control them or kill them. Like storms are living creatures. That's so cool to me! After my favorite character left I lost interest. Also I already knew where it was going (it's so easy to guess, I even flipped ahead to further chapters and to the end and I was right) and so I feel I don't need to continue, plus, I don't like Locke. I was told I quit before it got to the good part but this book already put me into a slump and I did not want to push myself into reading something so boring and predicable to me. "Feedback Man, oh man what a story! This takes 4 years after the events in books 2 and 3...."
"A heartwarming tale of first love. The Story: Finley hasn't had it easy. Her mentally ill mother can't care..."
"This book stole my entire heart in the best possible way. I laughed, I cried, and I pulled so hard..."
"For five years, Nora has been dreaming about the Sandman. After being told she's crazy, she finds it hard to..."
"This novella about Ella, a girl who's lost her passion for music, and Damon, the guy who helps rekindle it...."
"In the interest of full disclosure, the only reason I picked up this book is because my father actually WAS..."
"There are lots of points to love about this book: a slow burn 'friends to lovers" romance and a great..."
"Ada lives a life of thievery and steals what she can't afford to buy. Even though she's poor, she's lucky..."
"I've just finished reading ATGW and I read it in relatively quickly - I can be a fairly slow reader..."
"The story: Lock is a shy, closeted sixteen-year-old boy, transplanted with his little brother and alcoholic mother to Atlanta...."
"With her face hidden behind a hood/veil, Brynna protects the city of Forcadel. She works hard to bring down the..."
"M. Lynn has a way of grabbing ahold of your heart and giving it a squeeze with the words in..."
" Her style and descriptions lead you on a very interesting journey.... Leaving you very ready for the journey..."
"'We Thought We Knew It All' by Michelle Lynn follows the plot that readers found themselves immersed in when reading..."
"The story: Jackson Wolf, a teenage boy from one of Buffalo’s poorer neighborhoods, has it rough. His mother abandoned..."
"VORTEX VISIONS is a fantastic new book that starts a spin-off series from the Air Awakens books. While it is..."
"This is a very engaging story about a young doctor who sets out to solve a murder mystery. I..."